The French have enjoyed a svelte reputation, subject of the mysterious question: "Why don't they get fat?" There's even a popular book series exploiting this stereotype, so it must be true. When obesity rates started creeping up in France, the government felt it had to take action. God forbid the country end up like freedom-loving, fast food-devouring fat Americans! Instead of pretending like this health problem isn't happening, or shifting the blame to other cultural habits, France decided to nip this growing problem in the bud before it got any worse. The solution? 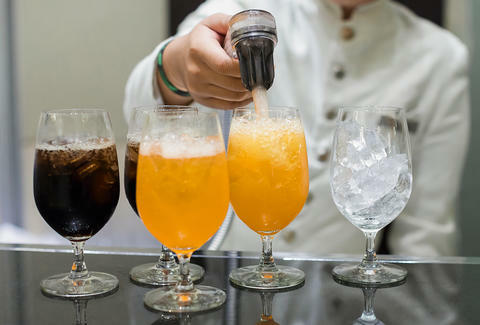 Banning free refills of sugary beverages. The move was designed to "limit, especially among the young" risks for obesity and related complications, such as diabetes, according to The New York Times. This follows other health initiatives France has implemented, such as eliminating vending machines from schools in 2004, and placing a tax on sugar-sweetened beverages in 2012. It may seem like overkill for a country whose population is only 15% obese, compared to America's 36.5%. But with 57% of men and 41% of women ages 30 to 60 in France categorized as overweight or obese, the country didn't want its population getting fatter and sicker. Americans, on the other hand, aren't exactly moving in the same direction. Despite attempts to place a health warning label on soda advertisements in San Francisco, and implementing a soda tax in Philadelphia and Berkeley, the country as a whole isn't exactly on board. Even as the soda tax appears to be effective in Berkeley, people in Philly are pissed about it, and the American Beverage Association has delayed the sugary drink warning labels to be posted in San Fran. When former New York City Mayor Bloomberg tried to pass a ban on big sodas in 2013, people lost their minds and it was struck down by the state's highest court -- land of the free, home of the obese! Sugar, while delicious, is pretty bad for you, especially in liquid form. Drinking sugar-sweetened beverages has been proven to put people at risk for obesity, diabetes, and cardiovascular disease. That should be enough to deter people from enjoying it too much, but people still consume more sugar than ever; the average American adult consumes about 88g a day, the average child 128g, according to the American Heart Association. It's easy to see how these high levels of sugar add up. A 12oz soda has between 30 and 40g of sugar, right around the recommended intake for your entire day. After a refill or two, you're looking at more than 300 calories, and up to 100g of sugar in your beverage alone. Considering how easy it is for people (especially kids and teens) to chug a few glasses of soda at one meal, consumption can get into dangerous territory pretty quickly. Sure, it takes some personal responsibility to not consume all of your daily calories in soda, and you might say that banning free refills is anti-freedom and anti-American. But there are other kinds of freedoms at stake for France, like freedom from shouldering the public health burden of obesity -- which in America runs up a bill of $147 billion. On top of that, when you add in the addictive qualities of sugar, can you really be certain that refilling your 64oz soda is a choice you're making freely? Perhaps France, in eliminating free refills, is giving its citizens a chance at the best kind of freedom: the freedom of health. Christina Stiehl is a Health and fitness staff writer for Thrillist who was formerly addicted to Diet Coke. Follow her on Twitter @ChristinaStiehl.